Baby hives are a case of hives that affect babies and toddlers. Baby hives are also called urticaria and welts, which are swollen spots on your baby’s skin. Baby hives can show up in many different sizes or shapes, but are normally quite easily defined and have a raised area in the center with a red border. Baby hives almost always itch, but they can appear and disappear within a few minutes, hours or even days. There can be many causes of baby hives, including food allergies (both from what the mom ate that the baby got from breast milk or what you your baby ate directly), medications, sun exposure, infections and even repeatedly touching the skin (known as dermographism). Baby hives are an allergic reaction your baby's immune system puts off when an allergen triggers the histamines to be released. The most common cause of baby hives is food allergies. As an example, my baby was deathly allergic to peanut butter and broke out in hives when I first gave her some at 1 years old. We had to rush her to the hospital as her breathing became restricted due to the allergic reaction. When she was a toddler, we also discovered that egg whites made her throw up (even if there was just a minor amount of egg in the food) and caused sever hives all over her arms and face - even if she only got some on her hands! There are many foods that cause baby hives including but not limited to peanuts, eggs, milk, wheat, soy and tree nuts. Medications like antibiotics and sulfa drugs are also common triggers. Additives like yellow number 5 also called Tartrazine is commonly found to be a trigger for children. Viral infections, bug bites or stings, latex, stress and exercise are all also common triggers for baby hives. To help know what is causing your baby's hives, keep a journal of all the medicines, foods and drinks that your baby has had leading up to a hives outbreak. That way you can look at the similarities between each outbreak of baby hives, and in the future will know what his or her triggers are. What are the Symptoms of Baby Hives? The most common baby hives symptoms are raised welts on various parts of your baby's body that most likely itch intensely. While your baby may not be able to tell you yet, baby hives are usually accompanied by a burning sensation at the spot of the outbreak. Baby hives can also have other symptoms, depending on the trigger. If your baby has an infection that is causing the hives, he or she may have a runny nose, cough, slight fever or a sore throat. 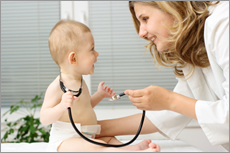 Baby hives are generally harmless to your child if they are the only symptom you notice. Children that have hives with other symptoms like wheezing, having hard time swallowing or even swelling in the mouth and throat are having a more serious reaction called anaphylaxis, and should seek medical attention immediately. How Do I Get Rid Of My Baby's Hives? Most parents are stressed and worried about their baby; and for good reason. Some cases of hives can cause internal damage or stress if left untreated. This is why I suggest speaking with your doctor when considering a baby appropriate hives treament. Hives can be scary for kids, and very uncomfortable. Using an antihistamine (such as Children's Benedryl) simply will not fix the hives rash, it only masks the itching. Using a treatment like OxyHives will not only help you get rid of the itching and pain, but also get rid of the hives outbreak. You should also remove or avoid any and all triggers you find that bring on hives in your baby.